The Board of the College of Pharmacists of BC strongly believes that incentives negatively impact a patient's decision to receive a prescription and/or pharmacy service. The Board felt compelled to act within its jurisdiction to protect public safety by implementing bylaws that prohibit the provision of incentives for a prescription or pharmacy service. Several other provincial Colleges already prohibit the use of incentives for prescriptions and/or pharmacy services. Alberta introduced thier legislation initially in 2014 which came into effect in Septmber 2017 following an appeals process, Quebec implemented their legislation in 1981 and reaffirmed it in 2008, Newfoundland and Labrador implemented theirs in 1998 and reaffirmed in 2008, Ontario implemented their legislation in 2004, and Prince Edward Island implemented their legislation in 2012. The College's bylaws are in effect as of January 27, 2016. Please see below for more information including definitions, examples and Frequently Asked Questions. Incentives are defined as: money, gifts, discounts, rebates, refunds, customer loyalty schemes, coupons, goods or rewards. Schedule III or unscheduled drugs, unless prescribed by a practitioner. Are glucose meters and diabetes test strips included in the prohibition of providing incentives? Glucose meters and diabetes test strips do not fall within the definition of “device” as defined in the legislation and therefore the bylaws do not apply to them. Note: In an example previously posted on the website, it was stated that diabetes test strips did fall within the definition of “device” as mitigating disease. In response to numerous inquiries, this example has been further reviewed and revised. Are medication management reviews included in the prohibition of providing incentives? 4) conclude that the incentive prohibition would apply to medication management reviews - no incentives can be provided. Why are incentives for prescriptions and/or pharmacy services unsafe? 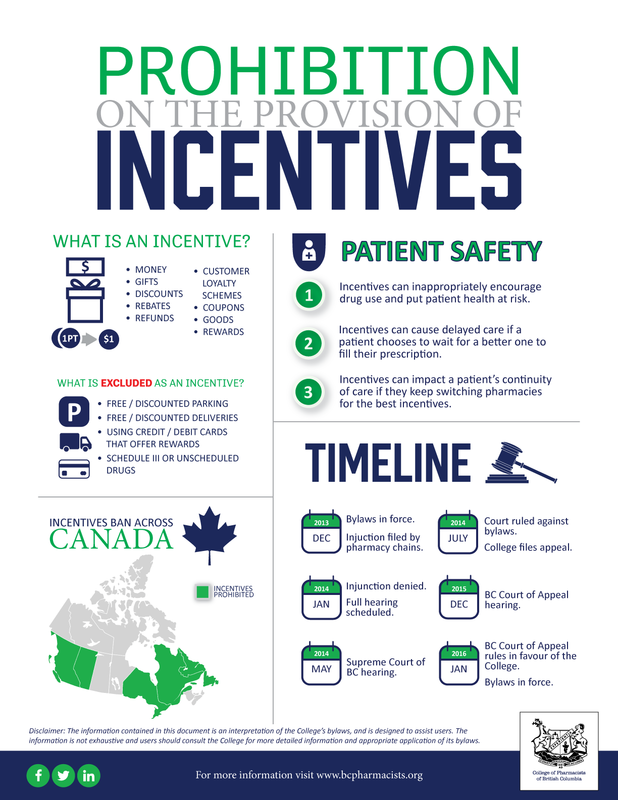 Incentives, such as redeemable points, are unprofessional, unethical and unsafe as they negatively impact a patient's decision to fill a prescription and/or receive a pharmacy service. Incentives can inappropriately encourage drug use which puts patient health at risk, and can disrupt continuity of care as a patient may switch pharmacies for the best incentive. The only motivating factor to fill a prescription or receive a pharmacy service should be the patient's best possible health outcome. When does this prohibition on the provision of incentives go into effect? Which pharmacies are covered by these bylaws? The bylaw changes are applicable to community pharmacy practice. That means community pharmacy owners, managers, and directors, as well as all pharmacists and pharmacy technicians in the province must be aware of, and be compliant with, the new requirements. Does this bylaw apply to every product or service offered by a pharmacy? What is excluded from the prohibition? Can I accept credit or debit cards that may give points for purchases made on them after January 27, 2016? Yes. Cards that grant points or other incentives to their customers may continue to be accepted and is excluded from the prohibition. Would free parking or free delivery (where permitted) be considered an incentive? No, these are specifically excluded in the Bylaw.